Why are there four Gospels, rather than just one? Which is the authentic Gospel? Dont the discrepancies between the Gospels demonstrate that they have been corrupted? How can the Bible be the Word of God when individual books bear the names of their authors (Isaiah, Matthew, Mark, etc.)? At best, these authors could be transmitters of the revelation sent down upon them. How can the authors of the biblical books be reliable transmitters when they are not direct eye-witnesses of the events recorded and do not even stand in an uninterrupted chain of transmitters, as is the case with the recognized Islamic traditions (Hadith)? For example, Luke never met Jesus and does not state the names of those from whom he received his information (Luke 1:1-4). The fundamental point here is that Muslims judge the Gospels – as indeed the Bible as a whole – by the standard of the Quran. Islam sees the Quran as the model and the criterion for every Scripture revealed by God. The Quran is the direct Word of God, revealed to the Prophet, who is neither more nor less than the conveyor of this Word. The text is unique and unchangeable; it is in no sense the result of human creativity.. The Quran is the criterion (al-furqan) of the truth. Every other Scripture must be measured against it. The Bible, including the Gospels, can only be treated as the Word of God where it is in harmony with the Quran. Those who have the Quran have no need to read the other Scriptures, which have all either been altered, so that they no longer correspond with the texts as they were originally revealed, or have at least been wrongly understood. So there is little interest among Muslims in reading the Bible, except out of a curiosity to discover the sources of the distinctive doctrines and practices of Christians. Such curiosity is anyway regarded with some suspicion among Muslims, as calling into question the clear truth of the Quran as the final revelation. 1. There is only one eternal Scripture, the mother of the book (umm al-kit?b, Quran 13:39; 43:4; cf. 3.7). (1) This is the very Word of God, immaculately protected on the preserved tablet (al-lauh al-mahf?z, Quran 85:22). In the course of time this original Scripture was revealed to prophets raised up by God: to Moses in the form of the Torah (more or less identical with the Pentateuch); to David in the form of the Psalms (Zabur); to Jesus in the form of the Gospel (Injil) and finally to Muhammad in the form of the Arabic Quran. All these Scriptures were sent down, dictated by God to the prophets, whose duty it was to transmit them word for word, without any corruption. 2. Each of these Scriptures is an edition of the one eternal Scripture. They all contain one and the same message, emphasizing the warning: You should worship and serve the one and only true God and set no other beings alongside him. Thus far the Scriptures of the Jews and Christians agree with the Quran, which, as the final and perfect edition of the Word of God, given in Arabic, contains the essential truths of all revealed Scripture, expressed with unsurpassable clarity and stylistic beauty. Where there is disagreement between the Bible and the Quran, this arises from the fact that the Jews and the Christians did not preserve their respective Scriptures perfectly, but corrupted them (harrafa, tahrif). 3. Muslim theologians and apologists point to various ways in which the Torah and the Gospel have been corrupted..
– The first five books of the Bible (the Pentateuch) cannot in their entirety be attributed to Moses. For example, the description of his death at Deuteronomy 34:5-8 must have been written by somebody other than Moses. The Bible contains further editorial additions of this kind. – The New Testament Gospels are full of contradictions, in, for example, their accounts of the genealogies of Jesus, his arrival at Jerusalem and Peters betrayal of Jesus. Furthermore, they were composed by four different writers, at least one of whom never met Jesus. They thus fail to meet the most fundamental of the requirements for reliable transmission, as expressed in the concept of mutaw?tir hadith, which requires that the attestation of a saying or deed of the Prophet must go back via an unbroken chain of transmitters to the original witness. 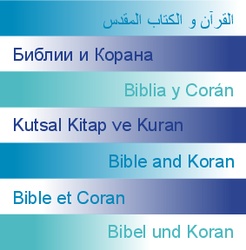 – It is well known that Christians have suppressed references to the coming of Muhammad in both the Torah and the Gospel (Quran 7:157; 61:6). Nevertheless, there are still traces of these predictions in the existing text of the Bible. The Torah speaks of a prophet like Moses who is to come: The Lord your God will raise up for you a prophet like me from among your own people; you shall heed such a prophet . . . .I will raise up for them a prophet like you from among their own people; I will put my words in the mouth of the prophet, who shall speak to them everything that I command. (Deuteronomy 18:15,18)(3) Johns Gospel speaks of one who will come after Jesus and teach the disciples all truth (John 14:16,26; 15:26; 16:13). – There are, however, some Muslims scholars, past and present(4), who have accepted the text of the Bible as it stands today. They suggest that the corruption of which the Quran speaks refers to misguided interpretation of the text by Jews and Christians from earliest times rather than to alteration of the actual text. Other contemporary Muslim scholars(5) recognize that the Gospels are based on knowledge of historical events, but add that the Christian interpretation of these events need not exclude other (e.g. Muslim) interpretations of them. – It should also be noted that some contemporary Muslim scholars(6) have begun to apply the principles of modern textual scholarship to the study of the Quran. They have, however, encountered considerable difficulties in their own societies, from both political and academic sources. 1. For Christians, the word of God is not in the first instance the written word of Scripture but rather the event to which Scripture bears witness, i.e. Gods communication of himself in human history. The Old Testament bears witness to the Exodus as liberation from slavery in Egypt and presents the making of the Covenant on Sinai and the occupation of the Promised Land as expressing the purposes of God, who is and will be with his people to save them. Christians find expressed in the writings of the New Testament their faith that Jesus Christ, the Word of God, is the definitive and perfect revelation of the God of Israel for all people. Among the Gospels there are differences in selection and emphasis; this can be seen, for example, in a comparison of the four passion-narratives. What is, however, common to all the traditions contained within the New Testament (i.e. Gospels, Acts of the Apostles, Letters, Revelation) is that they present the deeds and words of Jesus in the light of his Resurrection. It is above all the Resurrection of Jesus that reveals his true identity and the depths of his words. 2. The Bible, including the Gospels, was written by authors inspired by God; it is the word of God insofar as it was written under divine inspiration. Many biblical books were written down after a period of oral transmission. The result is the collection of texts, identified and preserved by the Church, which we call the Bible, including both the Old or First Testament and the New or Second Testament. The Church believes that these Scriptures, taken together in their totality, bear witness to the action and self-revelation of God. As believers we therefore encounter here the word of God. Just as the apostles consistently pointed back to the Scriptures (i.e. the Old Testament, at that time) so we also, if we are to recognize the word of God in the whole Bible, must likewise attend carefully to the Old Testament. 3. The word of God comes to us in human language. When the prophets speak the word of God they do so with detailed reference to the settings which they are addressing and to the groups of disciples who gather around them. Likewise, the Gospels communicate their message into the varied contexts of different early Christian communities. This explains why there is diversity within both Old and New Testaments, reflecting diverse perspectives on the same revelation. The biblical authors do not merely pass on words dictated to them; rather, in the distinctive ways in which they express the word of God that they have received, they bear witness to the fact that that word is a living reality. Modern textual analysis aims to establish what material in the Gospels can be ascribed directly to Jesus and what derives from the witness of the early communities. As we thus identify the essential principles of interpretation which were already at work within the Scriptures themselves, we will be helped to understand the significance of Jesus for our contemporary situation. 1. It is essential above all to grasp that the Muslim approach is to think of the Gospel in terms of the Quran, as a form or version of the Quran. Only then is it possible to speak meaningfully in dialogue with Muslims from the perspective of the Christian faith, based on the message of the Gospels. 2. It is not a helpful starting-point for dialogue to focus on the differences between the Gospels or (responding to the view that these differences are a problem) to present historical explanations for them. Instead, the content of the Gospels should be emphasized. 3. The Gospel is emphatically not a book. The Greek word euangelion means the Good News (of salvation) (al-bushra). Its content is the message of the love of God, communicated by Jesus, the Son of God. This message was not initially written down but was proclaimed by Jesus and then – again orally, not in writing – was passed on by his disciples, who lived with him and became witnesses of his life, suffering, death and Resurrection. 4. We bear witness that Jesus himself is the Word of God, Gods self-revelation. The Quran also calls Jesus Word of God (kalimat Allah, Quran 4:171; cf. 3:39-45), without, however, understanding Jesus as the Son of God. 5. With the four Gospels we arrive at written testimony about Jesus. They were written in the light of faith in Jesus as the Risen One and expect from the hearer or reader the same faith; they ask us whether we too will encounter Jesus as Lord. 6. The four Gospels embody the tradition of the Church, the extension in scriptural form, in the believing community, of the message of Jesus. This was originally proclaimed orally and reached written form in the second half of the first century. This understanding of the Gospels is to some degree analogous to the Muslim concept of Sunna – the preservation, outside the Quran, of traditions about Muhammads words and deeds. 7. The earliest New Testament manuscripts date from the beginning of the 2nd century. As is the case with the Bible as a whole, ancient manuscripts of the Gospels contain a number of variant readings. There is substantial agreement between the different manuscripts but there are also some significant differences. By applying the methods of textual criticism it is possible to reconstruct the original text with some confidence. Critical editions of the biblical text have been published and these editions take into consideration the most significant textual variants. The early Christian writings (Gospels, Letters, etc.) were gathered together by the Church into the Canon. In this process the Church did not acknowledge all available writings as authentic; some were excluded from the Canon and came to be known as apocryphal. 8. It is a non-negotiable basis for dialogue that each side should acknowledge that the Scripture on which the faith of the other community is founded forms the basis and the norm for the understanding and the expression of that faith. This point, which was recognized at the Muslim-Christian Congress held in Tripoli, Libya in February 1976, also implies the importance of Christians studying the Quran and Muslims studying the Bible if the dialogue between them is to be meaningful. 9. Like any other historical document, the Bible can be studied from outside the assumptions of the Christian faith. Thus the Gospels have been interpreted from a variety of positions, producing, for example, rationalist, Marxist, Jewish and even Muslim readings of the events which the Gospels describe. Each such reading deserves respect insofar as it takes seriously the intention of the text itself. In keeping with this concern to respect the otherness of texts, it is to be hoped that dialogue between Christians and Muslims will take seriously the differences between the Quran and the Bible. (1) Translations of passages from the Quran are based on the widely available translation by Abdullah Yusuf Ali, frequently reprinted since it was first published in 1934. All otherwise unattributed references of the type 5:82 should be understood to refer to the Quran; the first number, or a number on its own (e.g. 112), refers to the Quranic sura (chapter), and the number after the colon to the aya (verse). (2) On the Gospel of Barnabas see note 73 below. (3) Biblical quotations are from the New Revised Standard Version. (4) Ibn Sīnā (980-1037), Ibn Khaldūn (1332-1406), Muhammad Abduh (1849-1905), Sayyid Ahmad Khan (1817-1898). (5) Abbās Mahmūd al-Aqqād (1889-1964), author of the life of Jesus Abqariyyat al-Masīh (1952) – see Olaf H. Schumann, Der Christus der Muslime, Böhlau, Cologne/Vienna, 1988, pp.111-131; Fathī Uthmān (b. 1928 in Upper Egypt), author of Maa al-Masīh fi anājīl al-arbaa (With Christ in the four Gospels) (1961) – see Olaf H. Schumann, op. cit., pp.132-146; Khālid Muhammad Khālid (b. 1920), author of Maan, ala al-tarīq, Muhammad wa-l-Masīh (Together on the way – Muhammad and Christ, 1958) – see The Oxford Encyclopaedia of the Modern Islamic World, II, pp. 412-413. (6) Mohamed Arkoun (b. 1928, Algeria), Professor of the History of Islamic Thought and Culture at the Sorbonne, Paris; Nasr Abu Zaid (b. 1943, Egypt), Professor of Islamic Studies at Leiden.